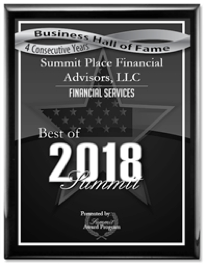 We’re proud to share that we’ve been honored with the 2018 Best of Summit Award in the financial services category for the fourth year in a row! As a national firm dedicated to serving all the wealth needs of our clients and helping them achieve their goals, we are thrilled to also be recognized in our local community. We love being a part of the business community in Summit, NJ and supporting it as a great place to work and live. Awards listings, rankings and/or recognition by unaffiliated rating services and/or publications should not be construed by a client or prospective client as a guarantee that he/she will experience a certain level of results if Summit Place Financial Advisors, LLC (Summit) is engaged, or continues to be engaged, to provide investment advisory services, nor should it be construed as a current or past endorsement of Summit by any of its clients. Awards listings, rankings and/or recognition published by magazines, and others, generally base their selections exclusively on information prepared and/or submitted by the recognized advisor. The Summit Award Program is an annual awards program honoring the achievements and accomplishments of local businesses throughout the Summit area. Recognition is given to those companies that have shown the ability to use their best practices and implemented programs to generate competitive advantages and long-term value.